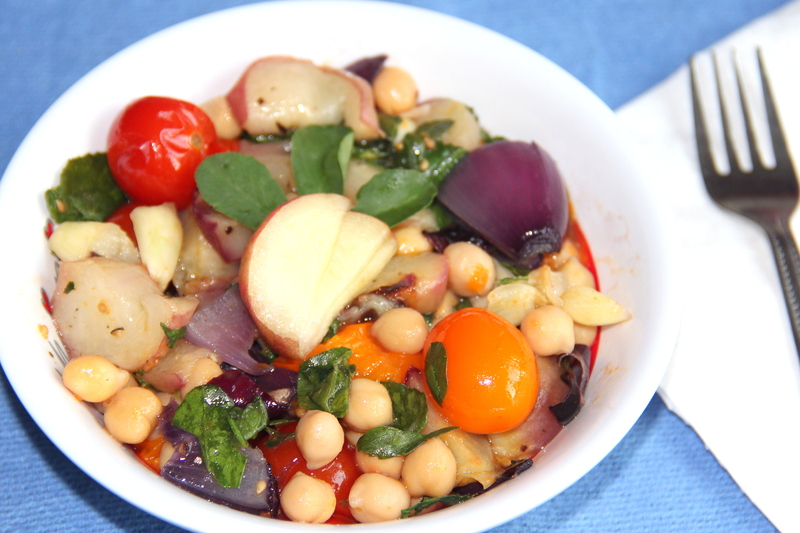 Roasted Peach, Cherry tomato, fenugreek leaves with chickpeas is healthy & Juicy salad. It is dressed with roasted garlic vinegar olive oil for tangy taste. This is fresh and delicious. Roasted peaches release all that fruity flavour. Fenugreek leaves provides good source of iron, it helps to control the hormonal level of insulin in the blood. Pre-heat the oven at 180 deg c, line and grease the baking tray. Place sliced onions, red and orange cherry tomatoes, garlic, peaches, drizzle with oil , season with salt, pepper and roast for 12-15minutes and after 15minutes place fenugreek leaves and roast for another 3-5minutes. In a bowl add olive oil, vinegar, pepper mix well add roasted tomatoes, peaches, garlic, onion, fenugreek leaves and garbanzo beans/chickpeas and give it a toss to combine well. Posted on July 10, 2014, in International, Salad/Wraps, Soups, Salad and Wraps and tagged chickpeas salad, Chitras healthy kitchen, Doughnut peach, drchdietfood, Fenugreek leavas salad, Peach salad, Roasted Peach salad, Roasted Salad. Bookmark the permalink. 23 Comments. Delicious salad. My pug Nando has diabetes and I give him capsules of fenugreek, cinnamon and some other herbs to help control his blood sugar levels so that I give him less insulin. It really does work. Oh he is on a very strict diet no sweets for him. Hugs and loads of love to him….. This salad looks too good Chitra, I liked the Peaches in it…..
Thanx malar. …peach was the main reason for me to try this salad ……glad you like it…. This salad looks divine. Thanks so much for visiting and liking my travel blog. I’ll love looking through yours. I like vegetarian food ofcourse, but I have to have my meat also. A bit here and a bit there. Balance is always good. I did send the link to a friend who she is a very strict vegetarian and still calls me a heartless person for eating meat. What can I do? I liked the salad section because I saw that you did get in quite some proteins and vitamines essential to our well being. I’m so glad you stopped by my site, which led me back to you! I’m always bouncing back and forth between healthier recipes and well – those not so good, and there’s a lot of inspiration here! I really like how you give a few tips on your posts about the healthy aspects of the food you make! Thank you so much for your compliments on my work. Healthy food doesn’t always mean tasteless and they can be made equally tasty and mouth watering….With amazing people like yourself support working towards it..